Blue Ice Group is a partnership owned by Steven Silver and Neil Tabatznik. In 2005, the duo bought into Barna Alper productions, which they sold to eOne in 2009. In 2010, the Blue Ice Group partnered with Echo Lake Entertainment to form the Blue Lake Media Fund. The fund provides financing for mid to large budget independent films and television series. In 2011, the Blue Ice Group acquired the South African production company Out of Africa, and with the owner Lance Samuels established Blue Ice Pictures. In 2014, Blue Ice Docs was founded to develop, fund, and acquire documentary film projects. Most recently, the Blue Ice Group founded SAMCAP (South African Media Capital), which helps with media financing in South Africa. Blue Ice Group is also responsible for a number of philanthropic initiatives including the Hot Docs-Blue Ice Group Documentary fund, which provides financial support to African documentary filmmakers for development and production. Blue Ice is also a co-owner of the Bloor Cinema theater in Toronto in a joint venture with the Hot Docs Film Festival. Neil is a partner and cofounder of Blue Ice Group and a producer with a wealth of experience in the film and television industry. As a co-owner of the Blue Lake Media Fund, Neil has executive produced a number of successful feature films including Steven Silver’s The Bang Bang Club and Alexander Payne’s Nebraska. Coming from a legal background in South Africa, Neil went on to found Cobalt and Oryx Pharmaceuticals and served as chairman until its sale in 2009. He is now a co-owner of Toronto’s Bloor Hot Docs Cinema, serves on the board of Hot Docs and the CFC, and heads up the Blue Ice team. Steven is a partner and cofounder of Blue Ice Group, which acquired an equity position in Barna-Alper Productions in 2005. Steven served as President of Barna-Alper Productions from 2005 to 2009, when it was sold to Eone Entertainment Inc. After the sale, Steven spent a year as head of Eone’s factual entertainment division. Also an Emmy award-winning writer and director, Steven is behind acclaimed documentaries such as Gerrie & Louise and The Last Just Man. 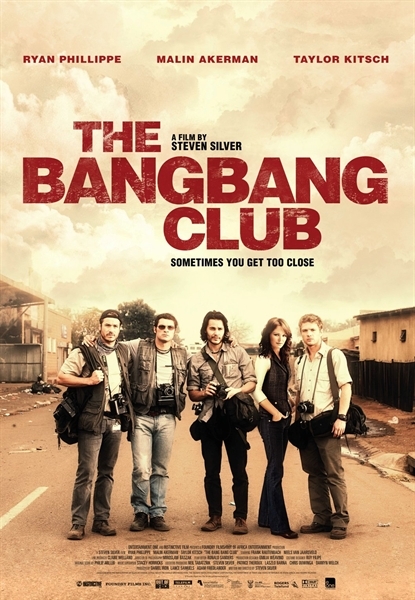 In 2010, Steven wrote and directed his first feature film The Bang Bang Club and is currently preparing to direct his follow up. The Bloor Hot Docs Cinema is an historic, century-old cinema located in Toronto’s vibrant Annex neighbourhood. Operated and programmed by Hot Docs Canadian International Documentary Festival, the venue is a year-round home for first-run Canadian and international documentaries, as well as special documentary presentations and showcases, including the popular Doc Soup screening series. It also hosts many of the city’s independent film festivals. Visit www.bloorcinema.com for more information. Founded in 2014 in partnership between Robin Smith, president of KinoSmith, and Steven Silver and Neil Tabatznik, co-owners of the Blue Ice Group, Blue Ice Docs intends to use the expertise and skills of both organizations to build a singular, world-leading documentary distribution entity that will take non-fiction product across all media platforms within Canada and beyond. Visit www.blueicedocs.com for more information. The Blue Ice Group-Hot Docs Documentary Fund is a grant program providing financial support to African documentary filmmakers for development and production. Development grants of $3000 – $8000 and Production grants of $5000 – $40,000 are awarded to approximately four to ten projects annually. Steven Silver and Neil Tabatznik, along with Echo Lake Entertainment president Doug Mankoff, are behind the Blue Lake Media fund, which provides gap and interim financing for films with budgets of $8 million and higher. The fund is backed by private investors in the US and Canada and invests in up to four films per year. The emphasis is on commercial fare with bankable directors and casts. One of South Africa’s premier production companies, Out of Africa Entertainment (OOA) offers international producers top-tier production services and co-production options in addition to producing for the local market. OOA has an experienced team and provides a “hands-on” approach to each production. This combination of skills and resources – in conjunction with access to financing – makes Out of Africa one of the leading and most progressive film production companies in Africa. Visit www.outofafrica.info for more information. South Africa Media Capital (SAMCAP) offers gap financing, interim/bridge financing, and rebate financing for television and film projects being shot in South Africa. With vast and extensive local and international production experience, SAMCAP understands the immediate and urgent financial needs of filmmakers. With the full understanding of the production process SAMCAP helps their clients anticipate and mitigate financial challenges and offer competitive finance solutions. Copyright © 2015. Blue Ice Group.